It's winter. Specifically it's late January. And it's cold. And the days are short. And, as I'm sitting here writing, it's snowing outside. Not a pretty white fluffy snow but, rather, a drizzling wet snow that is giving the cars and rooftops a white coating but just making the sidewalks wet. I find no joy in winter and I really want it to be spring already. But, there is one solace - winter citrus. It's always struck me as ironic that the sunniest fruit arrives during the bleakest weather but this is the time of year for Meyer lemons, ruby red grapefruit and every variety of delicious orange including the blood orange. And I can never resist. I seem to be incapable of walking past a display of blood oranges in the market without buying some. On the outside, most blood oranges look like traditional oranges with the occasional maroon colored splotch. But once you slice them open you see their full dark blood color. The taste is different than a traditional orange with a slightly raspberry flavor. And, happily, the unusual pigment is actually an antioxidant. So, flavor, beauty and health in one small round package. No wonder I can't resist them. So, I've talked you into buying them but now what, right? Well, you can really do anything with them that you would with a regular orange but the fun color makes it tempting to show it off. So a simple orange glaze with powdered sugar, milk and orange juice, for example, takes on a pinkish maroon color that looks very appetizing. 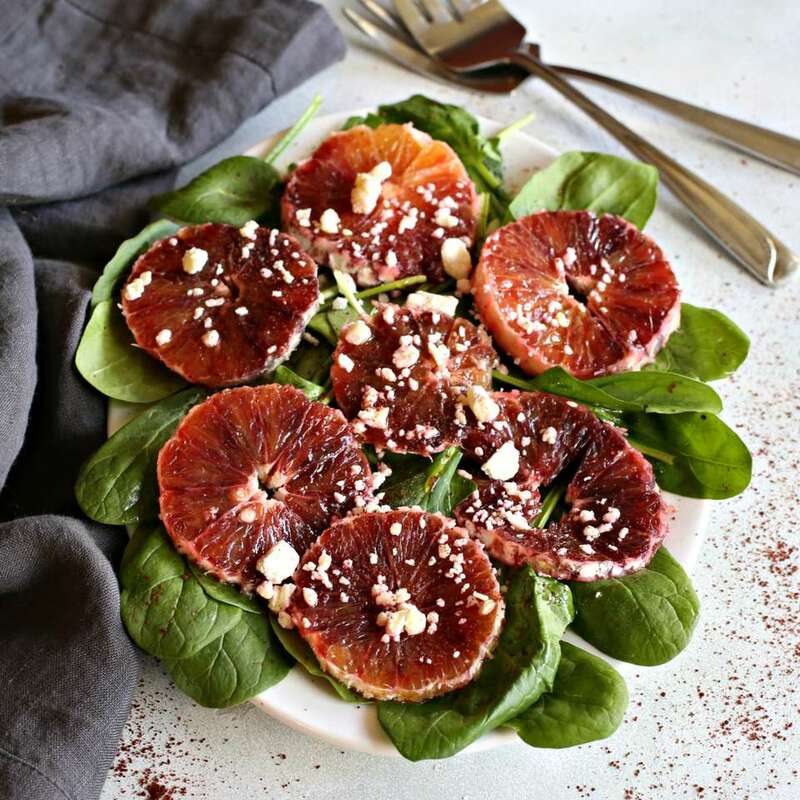 But one of the best ways to display the beauty of blood oranges is by simply peeling them, cutting them into rounds and serving them on a platter. My mother used to serve them as is with maybe a light sprinkle of sugar. But I also like adding them to a simple salad for a good balance between the sharpness of spinach and the sweetness of the fruit. Just add tangy cheese and a simple dressing that uses the juice as well as my favorite dressing condiment, the lemony sumac, and you have a delicious starter course. Wash and spin dry the spinach leaves and layer them on a serving platter. Peel the blood orange and cut into slices approximately 1/4" thick. Layer the orange slices over the spinach. Sprinkle the crumbled feta cheese over the salad. Whisk together the olive oil, blood orange juice, ground sumac, salt and pepper and drizzle over the salad.